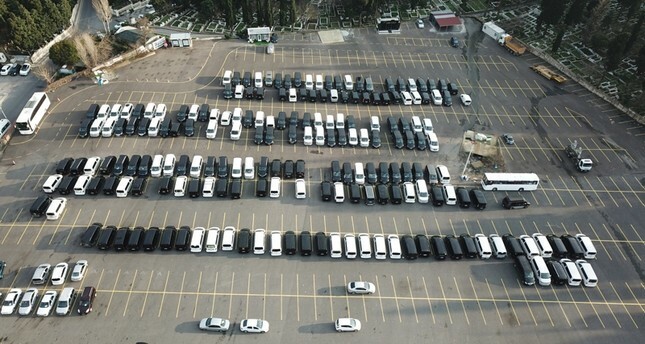 Thousands of minivans serving the transportation application Uber are believed to be waiting in depository car parks in Istanbul amid ongoing legal clashes with taxi driver unions and local authorities. Drivers working for Uber have been calling for an urgent legal regulation as law enforcement units currently fine drivers for unauthorized passenger transportation and bar their vehicles from traffic. Prohibited vans are towed to car parks run by a traffic police-affiliated foundation until they are returned to their owners through court rulings or their administrative fines are paid. Hundreds of vans are believed to sit in these car parks, though Uber drivers say this number may well be over a thousand. Metin Kayıhan Magriso – the chairman of Licensed Transporters Association (LITAŞ), which brings together the drivers of "VIP" vehicles serving in various sectors such as tourism, health and sports – told Demirören News Agency (DHA) that some 7,000 VIP vans currently serve Istanbulites within the scope of Uber. Magriso said that with the latest regulation in traffic legislation, which was brought to court by Uber and affiliated drivers, some 30 to 40 vans used by Uber drivers are being barred from traffic on a daily basis, while a similar number of vehicles are being returned to owners through rulings. "Our national wealth lies in car parks. When these vans work, they pay their taxes to our state every day, providing funds to the public," Magriso said. He added that long-term waiting periods in car parks cause damage to the vans, creating an extra financial burden for their operators. Magriso claimed that Uber serves Istanbulites with a "99 percent" appreciation rate and they want to continue this service. "There are currently some 15,000 people in Istanbul giving this service. We are talking about a serious sector. If we count their families, some 60,000 people make their living out of this. Count interior designers, repairmen, tire dealers and it may well reach 100,000. There are 3,300 firms working on electronic receipts in the Uber system – 3,300 people who pay taxes. We believe that this large group will not be forsaken," he said. Uber driver Serhat Çolak said that some 250 to 400 vehicles alone were barred from traffic on New Year's Eve. "Many of us worked on the New Year's Eve thinking that we would not be unjustly treated. We thought we would be allowed to work that night but we were wrong. Especially after 8 p.m., there were many prohibitions. Information on three, five, 10 vehicles barred in each district came from our WhatsApp groups," Çolak said. Çolak explained that each vehicle is barred from traffic for at least a month, and they remain in car parks for an additional 30 days as the vehicles lack driving permits. "For 60 days we can't make any money and our vehicles sit in car parks. My vehicle was disqualified twice for 60 days, but this was stopped after 20 days through a court ruling," he said. Due to conflicting administrative and legal practices, Çolak said that he is not sure whether the remaining 40-day disqualification period would cause him any troubles in the future, adding that his vehicle is currently barred from traffic again. In recent months, violent attacks by taxi drivers targeting Uber vehicles have made headlines in Turkey, amid an ongoing debate throughout the world regarding the legality of the application. Turkish taxi drivers allege that Uber is illegal, unfairly takes their market share and does not pay any taxes in return. There are some 18,000 registered yellow, "VIP" turquoise and "suburban" red taxi vehicles in Istanbul, which obtain their permits from municipalities by paying hundreds of thousands of Turkish liras. Following mass protests and public awareness campaigns, President Recep Tayyip Erdoğan said in June 2018 that the government will apply stricter measures against Uber. On the other hand, Uber claims that it is merely a service provider between customers and its affiliated drivers who meet the demands of the market. A lawsuit launched by taxi driver associations aiming to ban Uber in Turkey is ongoing. Taxi driver associations express that such behavior applies to a small portion of taxi drivers or drivers of so-called "pirate taxis." They also call for reform in the sector, tighter regulations for the selection of drivers and gradual transition of taxi plates to experienced drivers instead of plate holders employing others as drivers.